Science exhibition was organised at Sri RKM Sarada vidyalaya Girls Higher Secondary School, No. 134, Usman Road, T.Nagar chennai 17 – on monday 19th October. School Headmistress Tmt.R.Meena declared to open the exhibition. 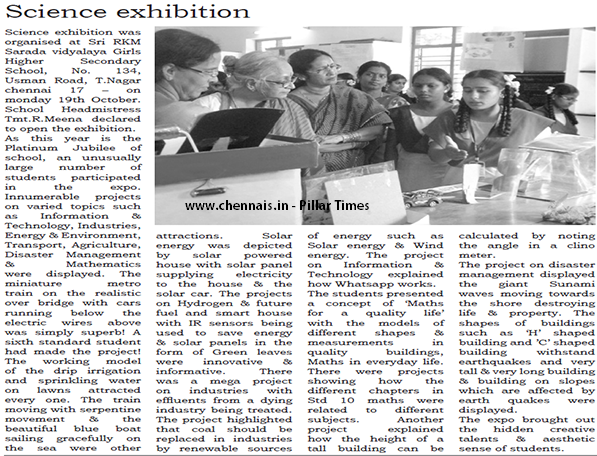 As this year is the Platinum Jubilee of school, an unusually large number of students participated in the expo. Innumerable projects on varied topics such as Information & Technology, Industries, Energy & Environment, Transport, Agriculture, Disaster Management & Mathematics were displayed. The miniature metro train on the realistic over bridge with cars running below the electric wires above was simply superb! A sixth standard student had made the project! The working model of the drip irrigation and sprinkling water on lawns attracted every one. The train moving with serpentine movement & the beautiful blue boat sailing gracefully on the sea were other attractions. Solar energy was depicted by solar powered house with solar panel supplying electricity to the house & the solar car. The projects on Hydrogen & future fuel and smart house with IR sensors being used to save energy & solar panels in the form of Green leaves were innovative & informative. There was a mega project on industries with effluents from a dying industry being treated. The project highlighted that coal should be replaced in industries by renewable sources of energy such as Solar energy & Wind energy. The project on Information & Technology explained how Whatsapp works. The students presented a concept of ‘Maths for a quality life’ with the models of different shapes & measurements in quality buildings, Maths in everyday life. There were projects showing how the different chapters in Std 10 maths were related to different subjects. Another project explained how the height of a tall building can be calculated by noting the angle in a clino meter. The project on disaster management displayed the giant Sunami waves moving towards the shore destroying life & property. The shapes of buildings such as ‘H’ shaped building and ’C’ shaped building withstand earthquakes and very tall & very long building & building on slopes which are affected by earth quakes were displayed. The expo brought out the hidden creative talents & aesthetic sense of students.